2062b, USED RIM, 16X6, 5 LUG, 4-1/2", 95-98, EAGLE, TALON, WHITE, 5 DIRECTIONAL SPOKES, ALLOY. 3060L, Used Rims, 16X7, 5 LUG, 4-1/2", 93-94, FORD, PROBE, 40mm OFFSET, (LEFT) 5 STRAIGHT DIRECTIONAL SPOKES, SILVER, ALLOY. 3060r, Used Rims, 16X7, 5 LUG, 4-1/2", 93-94, FORD, PROBE, 40mm OFFSET, (RIGHT) 5 STRAIGHT DIRECTIONAL SPOKES, SILVER, ALLOY. 3726, Used Rims, 16X7, 5 LUG, 4-1/2", 93-94, FORD, PROBE, 40mm OFFSET, (RIGHT) 5 STRAIGHT DIRECTIONAL SPOKES, SILVER, ALLOY. 6532, Used Rims, 15X6, 5 LUG, 115MM, 99-00, PONTIAC, GRAND AM, 5 DIRECTIONAL SPOKES, ARGENT FINISH, ALUM. 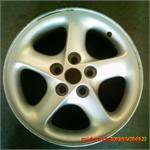 6532, Used Rims, 15X6, 5 LUG, 115MM, 99-00, PONTIAC, GRAND AM, [5 DIRECTIONAL SPOKES] ARGENT FINISH, ALUM.